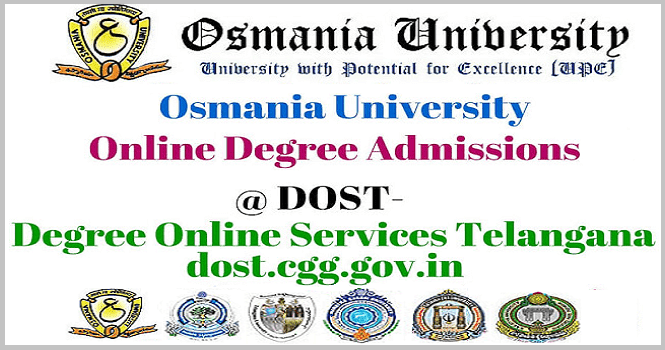 #DOST - Degree Online Services Telangana,TS #OU Online Degree Admissions 2018 notification, Apply online for degree admissions in Telangana Universities: Telangana State, Osmania University(OU) is going to publish the Online Degree Courses admission notification in March, 2018 and Online application forms are invited through online mode for registration and admissions into various undergraduate courses, such as B.A., B.Com., B.Sc., B.B.A., B.C.A., etc., offered by various colleges affiliated to Osmania University, which includes Constituent, Government, Aided, Autonomous and Private Colleges for the academic year 2018-2019. However, the interested candidates can also apply to the colleges of other five universities (Kakatiya, Telangana, Mahatma Gandhi, Satavahana and Palamuru Universities). DOST notification in first week of March: The notification for admissions into degree colleges through Degree Online Services, Telangana, (DOST) will be issued in the first week of March. Telangana State Council of Higher Education (TSCHE) will hold the admissions unlike last year when Commissionerate of Collegiate Education conducted the process. Last year, several students could not get admission due to lack of awareness and technical problems in the DOST website. TSCHE granted permission to start 150 courses in private degree colleges too. Officials will extend the deadline for implementation of biometric system in the colleges till the end of the next semester. Registrations and web options will remain open till June 6 while registration with late fee would be open till June 9. First phase students should report to colleges from June 15 to June 20 and second phase students can report from July 14 to 18. Degree Online Services Telangana (DOST) extended its admissions dates from June 4 to 7. Students ready to pay late fees of Rs 200 can apply till June 9. Officials working for the DOST admissions are busy trying to rectify the problem faced by candidates trying to register for online admissions for degree courses. Registrations and web options will remain open till June 6 while registration with late fee would be open till June 9. First phase students should report to colleges from June 15 to June 20 and second phase students can report from July 14 to 18. The schedule for undergraduate admissions of Osmania University for the academic year 2017-18 would be announced and registrations and web options can be done online mode. As per the schedule, the first list of seat allotment would be finalised. CLICK HERE for downloading the schedule. Web option will open shortly or closed showing... what's the next step....?